Independent film director David Noel Bourke talks to us about his Nordic Noir film Bakerman and his life behind the camera. Award winning Mikkel Vadsholdt plays Jens, a master baker having a mid-life crisis, in David Noel Bourke's Nordic Noir film Bakerman. A decade ago slipping the words Nordic Noir or Scandi Noir into casual conversation would probably have been met with confusion and the belief that the topic at hand had abruptly switched to IKEA furniture. Nowadays, we’re much more enlightened, Nordic Noir also known as Scandi Noir, has become ubiquitous, with excellent TV shows like The Killing, The Bridge and Trapped finding worldwide audiences. Unsurprisingly the aforementioned shows were all created by Scandinavians. Makes sense doesn’t it. If you’re making Nordic Noir you should at least be Nordic. However, Irish director David Noel Bourke has shown you don’t need to be Scandinavian to make a gripping Scandi Noir drama. Bourke’s latest feature, Bakerman, dubbed a Nordic Falling Down, has been earning notable plaudits. The latest achievement for the Bakerman team was leading man Mikkel Vadsholdt winning best male actor at the Nordic International Film Festival in New York. No mean feat for an indie film. Mikkel Vadsholdt won the coveted best actor award at the Nordic International Film Festival for his portrayal of Jens in Nordic Noir drama Bakerman. David Noel Bourke is a Denmark-based, Irish-born independent filmmaker. An efficient writer, director, and editor, David has made three independent feature films: Last Exit, No Right Turn and Bakerman. These films have been launched around the world from US, Germany, Sweden and Denmark. 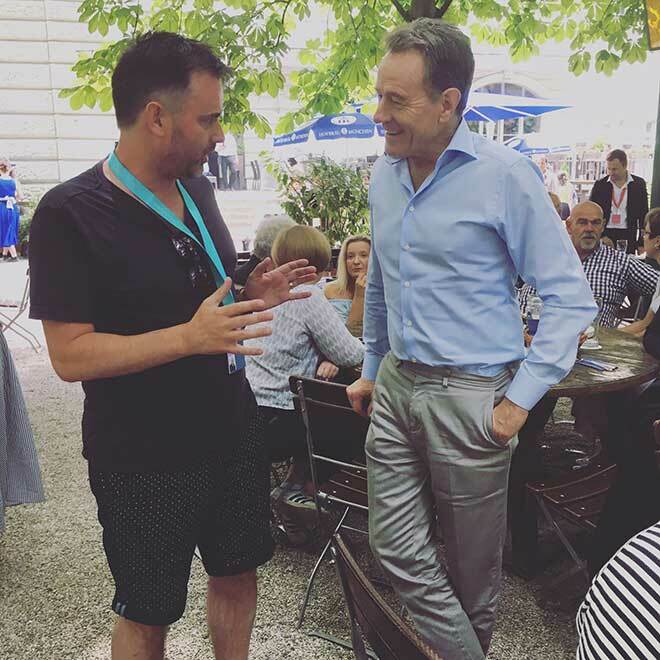 David and Bryan Cranston catching up at the Munich Film Festival. Nordic Noir drama Bakerman is Bourke’s third feature film. In Bourke’s first Nordic Noir offering, Bakerman, we meet Jens (Mikkel Vadsholdt) a master baker in a mid-life crisis. Jens has accepted far too much for too long. Being the shy night-owl he is, he keeps to himself, but the world will not let him be. The new master baker’s quality starts slackening, and when a bunch of yobs one day smash the window of Jens’s car, he takes one of them out. Intoxicated by his own new unexpressed vigour, Jens comes out of his shell, but the destructive driving force leads him towards a free fall. 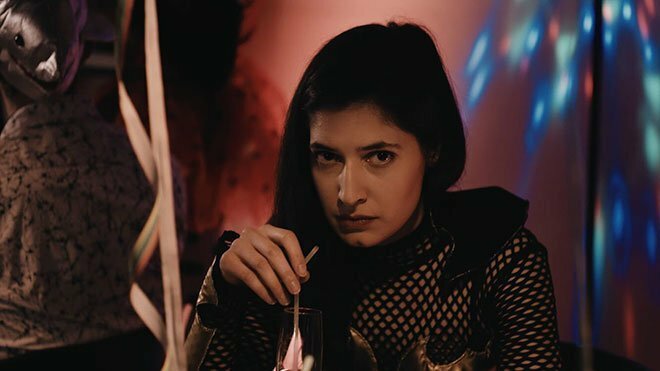 Bakerman is a Nordic Noir film that is as shocking with its vigilante story as it is captivating with its determination. Starring award winning Mikkel Vadsholt, Siir Tilif, Brian Hjulmann and Mia Lerdam, Bakerman has all the ingredients to be a Nordic Noir smash hit. 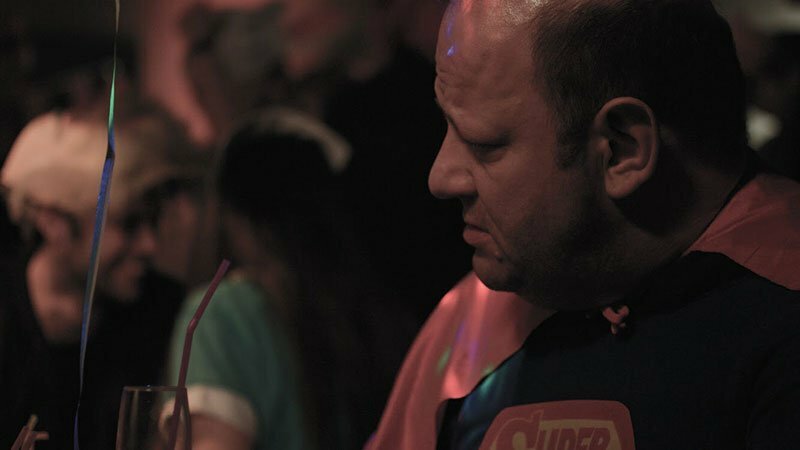 We caught up with director David Noel Bourke to find out more about his life behind the camera and what inspired him to start making movies. How did your love for film get triggered? Growing up we were the first household in Ireland I think to have a VHS player, my father brought back all sorts of films, this coupled with going to cinema, I was hooked on the escapism and the imagination that can be found in the movies. When did you realise that making films was more than a pastime and that it would also be your livelihood, forming a big part of your life? I wrote a lot of early scripts and stories in my teens. I always visualised these as movies and wanted to see these movies made but had no idea how. But I could write them. As the digital revolution came along it became more much more accessible and I tried my hand at some small filmmaking and fell in love with it – the whole process really…and never looked back. Which is the greater challenge, getting started or finishing the project? Can you think of a specific thing you’ve had to overcome to do either? Starting can be a challenge for sure. It’s all about choices of which direction is the most effective. Also which script to run with and if you feel it’s ready and are you ready? You better say, yes! Now that I have many features films under my belt, it’s less daunting but still it’s nervous to jump…but once you jump…you jump and then it’s about completing the job. Finishing can be hard. But one thing I can pride myself on: I always finish my projects. Always. Filmmaking is very hard work (mentally and physically) and being independent it’s 100 times harder. Typically the motivation and excitement of cast and crew are high at the start but it tends to go down as you shoot. Folk get tired and sometimes even bored and maybe can’t see the final film from the day’s work – so one of the many jobs as director is to keep motivation up and keep positivity going and have the bigger picture in focus. For Bakerman the final scene, the party scene at the end where Jens looses his girlfriend and realises the problem with the world is maybe within himself was a big challenge, it was subtle scene but also a big scene. We had many extras and a big location and it was an evening scene but we shot very very early in the morning. It was delayed many times. So getting the main actors in and the extras and the location was extra difficult. But we got there! Now that I have many features films under my belt, it’s less daunting but still it’s nervous to jump…but once you jump…you jump and then it’s about completing the job. Siir Tilif in David Noel Bourke’s Nordic Noir film Bakerman. What counsel would you offer to those thinking of committing their lives to making films? Have your own stories or stories that drive you, your own vision and a unique voice – it maybe a weird voice but it’s yours. Try being positive, working hard and don’t let the nay sayers get to you. A lot of folk tell you why you can’t make a film – listen to everyone but go make your movie anyway, there are no rules in this game – make the most of it and just surround yourself with positive supporting folk who contribute in a good way. How have you discovered project collaborators and how do you maintain a strong relationship with them? Usually through friends, getting good recommendations, the internet, social websites, casting sites etc. I always have reciprocal relationships with others, we help each other out on our projects, read scripts, help on set etc. That’s very important. What personal qualities do you think a good film director needs, and what do you do to develop them? You need to be a good people person in general. Stamina, good sense of humour and of course use your own storytelling skills for what you are trying to do. For me it’s important to be daring, brave, open to input at all points of the creative process. I think experience helps increase confidence, sometimes being comfortable about not knowing exactly how things unfold is a good thing. Surprises always happen and can be very nice, sometimes they work out and sometimes not – you need to be able to roll with it. Keep learning and the best way is to go out and try make a film. For me it’s important to be daring, brave, open to input at all points of the creative process. I think experience helps increase confidence, sometimes being comfortable about not knowing exactly how things unfold is a good thing. You’re an Irishman living in Denmark. How does where you live determine how and what you produce, and how do you think Denmark impacts your work and process? It’s all about stories really. On a subconscious level I suppose living in Denmark and being from Ireland gives me a fresh angle. Bakerman had elements of immigration in it, society reflects your art but at the end of the day I want to tell an interesting/challenging stories and I try not to self-analyse too much. I will leave that up to the audience! What makes a classic film? Are there certain aspects that make a film stand-out for you? Good stories. Great acting. Powerful scenes. An engaging soundtrack. A memorable opening or ending. Even if it’s a smaller film, having a weird or a controversial moment can make a movie stand out for me. What films have been the most influential to you and why? My first movies are what I called my “feel bad” films, now I want to make some “feel good” films or maybe “feel good-ish” films. It changes all the time. When researching I usually get inspired very much. Currently working on a science fiction project “The Boy Who Stole The World” and watching a lot of sci fi for inspiration (2001, ET etc.). Also, I’m working on an Irish comedy called “The Teeth of Richard Harris”, so checking out a lot of working class Irish stuff (stuff like The Commitments/Angela’s Ashes etc..) and really getting inspired by it. I enjoy and get inspired by nearly all genres. My first movies are what I called my “feel bad” films, now I want to make some “feel good” films or maybe “feel good-ish” films. Do you ever get angry at a film? Are there themes or ideas in current cinema that turn you off? Maybe syrupy romantic comedies make me angry or as my wife says I’m just scared of them. Turn-offs? Remakes or lazy sequels generally annoy me especially if the originals are just too good. Example the big budget remakes like Total Recall, Pyscho, The Thing, Robocop, Clash of the Titans – they play like video games with CGI overdoses. CGI is a tool – use it wisely – Hollywood has a very bad addiction to it and it’s soul crushing for the art of filmmaking. The original Star Wars (A new hope) is miles better than any of the newer ones with no CGI. That says a lot. When do you know a script is finished, and what is your process of getting it over the finish line? Art is never finished its abandoned! I guess at a writing stage you feel you cannot add or take away without changing your original story – then it’s time to move to next stage. As a filmmaker you know in the back of your mind when cast/crew and creative folks come on board they sometimes contribute with their ideas you’re are always enhancing and developing. That’s the fun of it. What role have film festivals played in your career so far? Why are they needed? How do you get the most out of them? If there is one thing you think would make the movie industry better, what would it be? Making films is art. Selling them is the business. If you’d like to catch up with David you can follow him on Twitter. Bakerman will be available to view via video on demand soon.